Coming into the new season most people seem to have decided that the ‘old breed’ were done for and the sport was firmly in the hands of the youngsters, the Loic Brunis and Josh Brycelands of the competition. 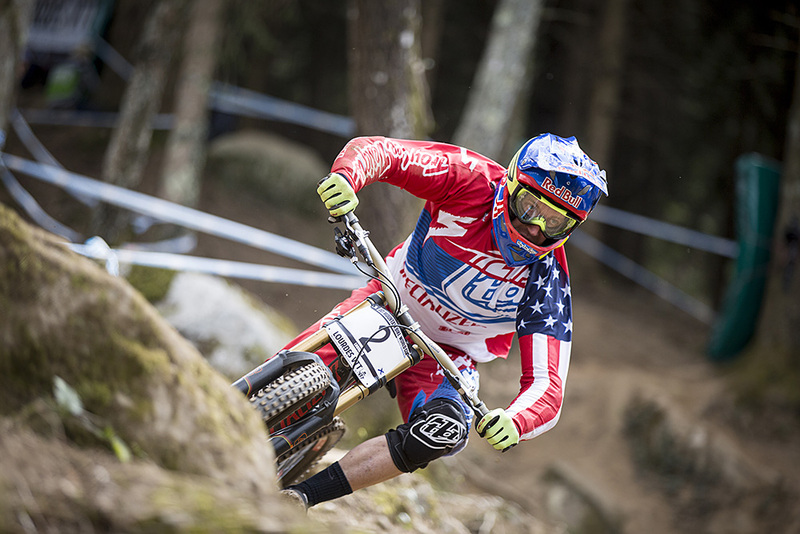 Whilst it is only the first race of the season, Gwin threw down the firm message that he still means business and that he should not be so lightly sidelined. Mike Jones of the Chain Reaction team is one of the youngest on the circuit but has already proven he is a definite contender for a top spot. 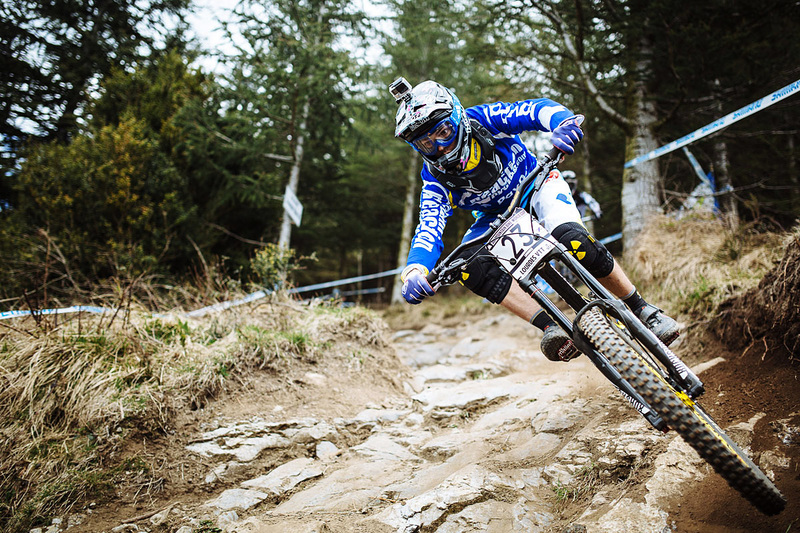 Living out in Australia with his team mate Sam Hill seems to have paid off; racing his first year as an elite and taking a third position is a belter of a way to start a season. 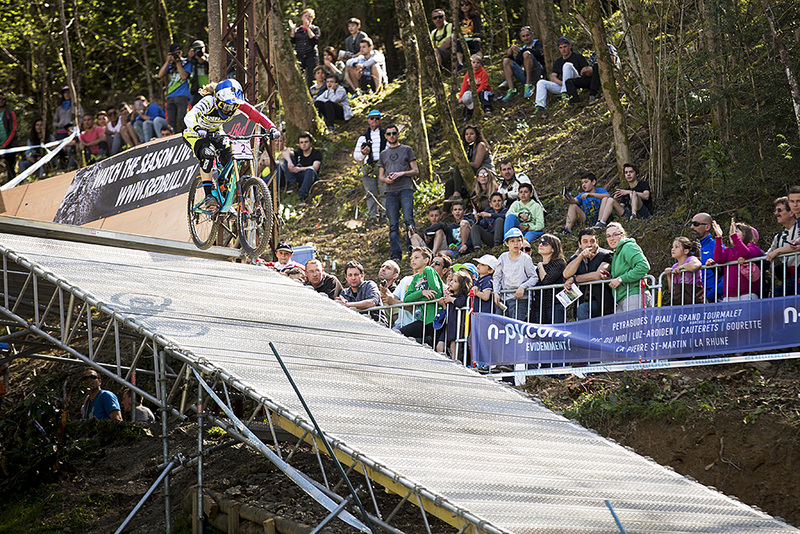 Things are already heating up this year in the women’s side of the racing. Whilst last year finished tight with only 60 points separating Carpentor, Atherton and Ragot it was still easy for many people to blame it on Rachel’s multiple illnesses. However, this season it seems there is no such scape goat; with Ragot putting down a formidable performance to take first from both Atherton and Carpenter. We can only wonder what might have been had Tracey Hannah (who qualified first) not taken a heavy tumble and separated her shoulder on the lower section of the track in her finals run. 6. No Stevie Smith, again! One of the sadder things we learnt this weekend in Lourdes is that we wouldn’t be seeing much of Stevie Smith’s bold and ballsy style; with an injury to his navicular bone in his foot, Stevie sidelined himself from the action this weekend. It’s been a turbulent couple of seasons for Smith who injured his ankle last February then busted himself up again in Monte-Saint Anne. However, the Canadian remains hopeful he’ll return for the Fort Bill round in a couple of months. Last summer Scwalbe released their Procore system. New to riding and even newer to racing, the system promised, amongst other things, a puncture resistant tyre. However, the system doesn’t seem to be infallible when it comes to tyres being blown off the rim as Neko Mulally demonstrated in his race run on Sunday. He wasn’t the only rider struggling with flats out on course, with Andrew Neethling struggling with a flat tyre and eventually, a very battered rim. You won’t catch many downhill racers running an air shock on the back of their rigs. For years, a coil setup has been the only option to cope with the extreme heat build-up experienced during downhill racing. But huge strides have been made recently, and now they seem set to become more popular, with weight saving and spring curve tuning options being the primary attractions. In 2013, Remi Thirion won the Vallnord World Cup on a BOS air shock, but you’ll need to dig deep in the archives for the previous victory on anything but a coil spring. Aaron Gwin lighter than air. 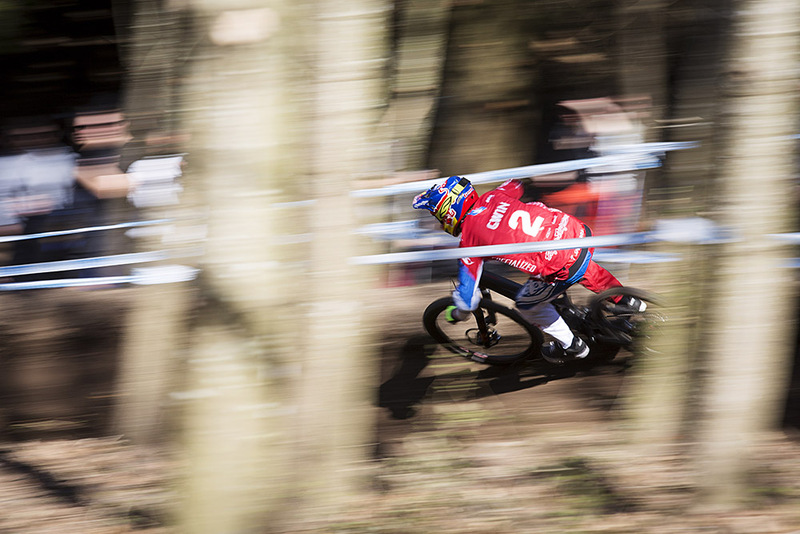 He took the most creative lines at Lourdes, can we attribute his win to just the air shock? Probably not. Image by Red Bull. The familiar grace and style was present in Lourdes, floating over the rough stuff in that way which is typical of Fairclough. A regular on the Rampage and free ride scene he was clearly demonstrating the skills he’s been teaching in his masterclasses. Along with the style was an injection of pace in his riding; pulling him into 6th overall and narrowly missing out on a podium. Fairclough maybe benefitting from his off season working with his team mate Neko Mulally and the decision by the Gstaad-Scott team to drop down to only two riders.